Solutions, examples, and videos to help Grade 7 students how to efficiently add integers and other rational numbers. Add integers with the same sign by adding the absolute values and using the common sign. Add integers with opposite signs by subtracting the smaller absolute value from the larger absolute value and using the sign of the number with the larger absolute value. Students justify the rules using arrows and a number line or by using the Integer Game and extend their findings to begin to include sums of rational numbers. 1. Find the absolute values of the integers. 2. Subtract the absolute values. 3. The answer will take the sign of the integer that has the greater absolute value. To add rational numbers, follow the same rules used to add integers. The following figure gives the rules for adding, subtracting, multiplying and dividing integers. Scroll down the page for more examples and solutions. a. Represent the sum of 3 + 5 using arrows on the number line. b. Represent the sum of -3 + (-5) using arrows that represent and on the number line. From part (a), use the same questions to elicit feedback. In the Integer Game, I would combine -3 and -5 to give me -8.
c. What do both examples have in common? 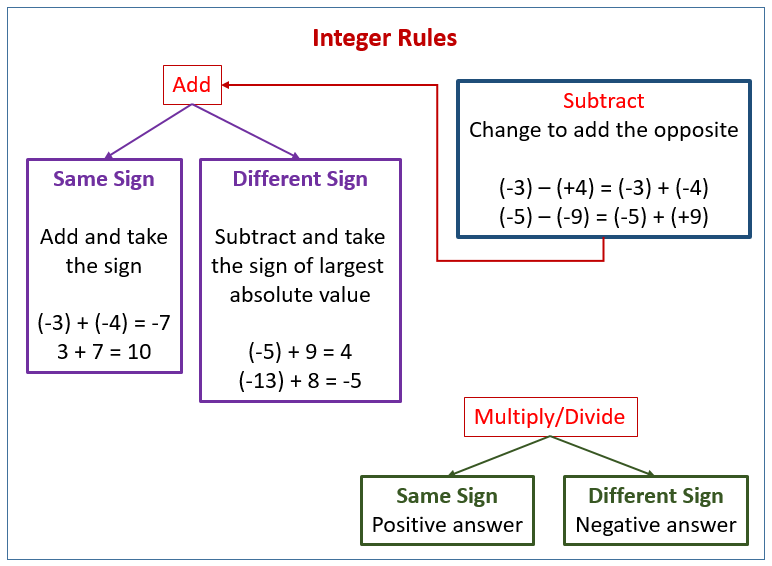 Rule: Add integers with the same sign by adding the absolute values and using the common sign. a. Decide whether the sum will be positive or negative without actually calculating the sum. a. Represent 5 + (-3) using arrows on the number line. b. Represent 4 + (-7) using arrows on the number line. RULE: Add integers with opposite signs by subtracting the absolute values and using the sign of the integer with the greater absolute value. 1. Circle the integer with the greater absolute value. Decide whether the sum will be positive or negative without actually calculating the sum. Find the sum of 6 + (-2 1/4). The addition of rational numbers follows the same rules of addition for integers. b. If the temperature outside was 73 degrees at 5:00 pm, but it fell 19 degrees by 10:00 pm, what is the temperature at 10:00 pm? Write an equation and solve. c. Write an addition sentence, and find the sum using the diagram below. 3. Use the diagram below to complete each part. a. Label each arrow with the number the arrow represents. b. How long is each arrow? What direction does each arrow point? c. Write an equation that represents the sum of the numbers. Find the sum.